In loving memory of my late Father. Today is his 4th year death anniversary. He is always remembered by his children and people whose lives were touched by his ministry and example. I really miss him. The legacy that he passed on to us will always be treasured. 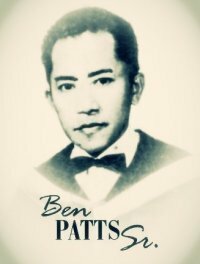 On September 17, 1921, in the small town of Montevidio Carmen Bohol, Bienvinido Patts Sr. was born into a humble farmer’s home. 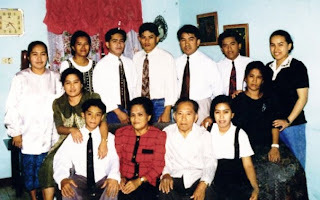 He grew up to be a bright young man and supported himself through college in which he graduated as cumlaude with AB/BS degree in Education-Majoring in English at the Rafael de Palma College (now Bohol University). He became a professor thereafter at the Southern Island Colleges and Emmanuel Colleges respectively from 1956 to 1969 – teaching English, Economics and World History. In April 28, 1954 he married Ms. Lily Buscano, a beautiful young lady from Polomolok, South Cotabato whose family was originated from Candijay, Bohol. Their marriage was blest with 11 children, 24 grandchildren and 3 great grandchildren as of February 2007. Bro. Patts came to the Oneness truth in 1968. At that time, he was very active in the Evangelical Church of God. He founded a Bible school and also served as a Bible doctrine teacher for the Assemblies of God. Part of his work was to translate English tracts to the Visayan language. That same year he received a letter from Mr. Chuck Malay, a brother who attended Bro. David Gray’s church in California. Bro. Malay got hold of one of the tracts that had Bro. Patts’ name on it as the translator. Bro. Malay contacted Bro. Patts and asked him to translate certain tracts for him, which he gladly agreed. These were the tracts, “Why We Baptize in Jesus’ Name” and “Mystery of all Mysteries”, a tract on the Oneness of God in Jesus Christ. While translating the tracts, he was able to read the Bible references and verses. He then had a desire to dig deeper into it and be certain of the truth. He got so interested in this new doctrine that he wrote Bro. Malay to ask of what denomination he belongs to. Not long after this incident, Bro. Buckmiller, a UPC missionary in the Philippines knocked on his door and met with him at his house in General Santos City. This visit was followed by another meeting the week after but this time, Bro. Buckmiller brought with him Bro. Joe Quiboloy and Bro. Celestino Minoza. Together, they expounded to him the Oneness of God in Christ. He received the full revelation with gladness heart. That same day he and his wife were baptized in the loving name of Jesus! Because of this, the first UPC work in General Santos City began. Services were held in Bro. 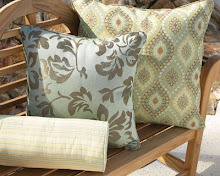 Patts’ home. Later, they rented a bigger house for worship with Bro. Minoza as the pastor. In 1969, Bro. Carl Adams told him of his desire to open a Bible school in Luzon. For this reason, the Patts’ family moved from General Santos to Angeles City to open the said Bible school. UPBI was then established as a place that provides formal training for future ministers. Among many others, some of the first batch students were Brothers Romeo Navallo, Alcantara, Absalom Gamayon and Apollo Quiboloy. Bro. Patts was also appointed the first director of the Board of Christian Education. Towards the end of the year 1969, the Patts family moved to Manila after Bro. Adams decided to transfer UPBI to a new rented building in Burgos Street, Makati Avenue. This was the first opened work in Manila. The first members were The Adams and housemates/helpers, the Mallory’s, the Nepstad’s, the Patts’, the Fondevilla’s and Pastor Donnie Ompad who opened a work in the Cavite area. Bro. Patts was also elected by the Executive Board as General Secretary of UPC Philippines, a position he held for 25 years. He became the Dean of the ACTS Bible College (now CP Kilgore Memorial College) in Manila until his retirement in 1999 at age 78. In addition, he operated a correspondence course for ministers wanting to know more about the ministry but was unable to study formally in the Bible school. It is his lifelong dream to build a Bible college and a foundation. He went on to pursue this goal which he managed to operate The Return To Christ Mission Foundation for several years. However, it could not continue due to lack of funds. Now, four (4) of his children are married to preachers, two (2) are ministers of the gospel, three (3) are very active and faithful servants of God. After his retirement in 1999, resided in San Francisco, California with his three children and their families. Towards the twilight of his years, although Parkinson’s disease has gripped his body, he remained to be a man steadfast in his faith despite of his failing health. A very strong example to all his children and grandchildren as a true servant of Jesus Christ. Most of his children are involved in the ministry under the United Pentecostal Church organization. Bro. Patts went to be with the LORD on January 22, 2007. His earthly body was intern at the Manila Memorial Park, Dasmarinas, Cavite, but his spirit now rests in the sweet embrace of our Lord and Saviour, Jesus Christ. He was 85 years old. You are so blessed to have a father like that, he lived a long productive life and truly did leave behind a legacy that his children and grand children can be proud of and successfully follow. The world could use more men of God like him. No wonder you are the kind of person that you are, you have been gifted with his steadfastness. A rarity in this world. That is one of the things that I love about you.